The world's first 3D printed burner has been tested at a gas-fired power plant. Siemens and E.ON have reached a significant milestone in the area of 3D-printing for the energy sector. They announced September 19 that "the world’s first 3D printed burner for an SGT-700 gas turbine has been in operation for one year at E.ON’s combined cycle power plant in Philippsthal" in central Germany. The burner has been operating for over 8,000 hours with no reported issues, they said, and the results are "impressive." Siemens began printing gas turbine burners in 2017 using selective laser melting technology; the first burners were produced by Siemens’ intelligent burner manufacturing (IBUMA) program in Sweden. Each burner head is manufactured in one piece, compared to traditional methods that requires 13 individual parts and 18 welds. "Design improvements, such as the pilot-gas feed being part of the burner head instead of the outside fuel pipe, allow the operating temperature to be kept lower, thus contributing to a longer operational lifespan of the components and, ultimately, the gas turbines," it added. Niklas Lange, project manager at E.ON Energy Projects said: “When I saw these burners from Siemens in Sweden, I knew we could benefit from using them in a commercial turbine. It’s also important to note that our hands-on collaboration with Siemens has been a key to deliver performance to our customer." Vladimir Navrotsky, chief technology officer, Siemens Power Generation Services agreed: "Early results from the IBUMA burner with E.ON validate our belief that this technology is a game-changer." Siemens began investing in metal 3D printing back in 2008 and developed the technology specifically for power generation. In 2012, Siemens installed the first EOS M280 SLM printer and adapted it for burner repairs. 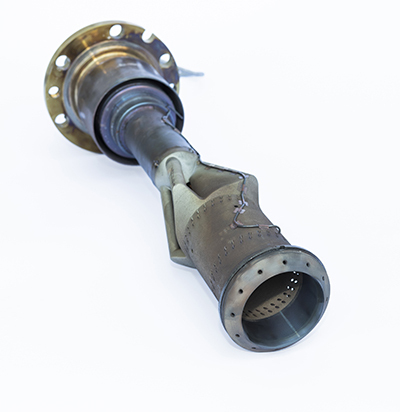 In 2013, the first 3D-printed burner tips and swirlers were installed in commercial gas turbines. In 2016, Siemens acquired Materials Solutions based in Worcester, England, one of the world's leading companies in the field of additive manufacturing. In 2017, Siemens’ 3D-Experts designed and printed the world’s first gas turbine blades and validated them under operating conditions. Later that year, the burners that were later deployed in Philippsthal for E.ON, were built in Finspång, Sweden.